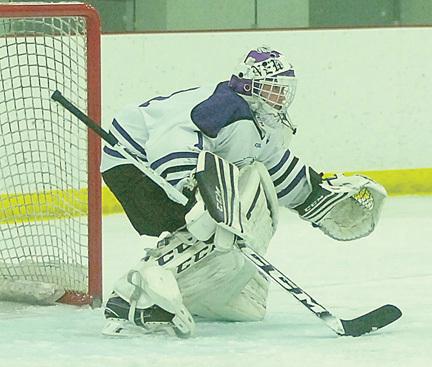 NEW UM — When New Ulm High School goalie Jack Raymond made a save early on Jan. 24 in the Eagles’ 4-3 home win over Hutchinson, not many people outside of the Eagles’ coaching staff and players realized what had just happened. The senior goaltender had passed Brach Kraus’ school record of 1,736 saves, and with 15 saves in the Hutchinson game, Raymond now holds the New Ulm High School boys’ hockey career saves record at 1,769 and counting. He also has 14 career shutouts. Raymond said that he knew going into the Hutchinson game that he was close to breaking Kraus’ career mark set in 2014. Ryan Neuman, Raymond’s high school coach since he started in nets as a sophomore, said that Raymond is technically sound in the nets. “He is very athletic and he makes saves when he has to,” Neuman said. And how solid Raymond would be in goal for the Eagles may have been crystal-balled in Raymond’s first start for the Eagles as a sophomore in a game against Virginia/Mountain Iron-Buhl. In that game, he set a state record for saves in a game with 64 in a 3-0 New Ulm win. Neuman said that he noticed something special about Raymond years ago in Bantams. Neuman said that he was impressed by Raymond’s composure at a young age and that composure and leadership has continued. Raymond gives a lot of credit for his success to the player whose record he broke in the Hutchinson game, Brach Kraus. As for Raymond’s hockey future after graduation, Raymond is thinking about playing Junior Hockey next year.